Make sure to bring enough water for everyone, as well as some extra in case of an emergency. Pack snacks and food as choices are limited once inside the park. Bring a small first aid kit too for any unforeseen scrapes along the way. There are areas in the park where you may not have reception. Take advantage of the cooler morning and evening temperatures. Avoid hikes during peak sun times. Spring is the best time of the year to go. It’s generally a good idea to avoid going during the summer. If you are planning to visit several national parks within the year, the “America the Beautiful” annual pass may save you some money. If a member of the family is in the military or if you have a fourth grader, they are eligible for free yearly passes. 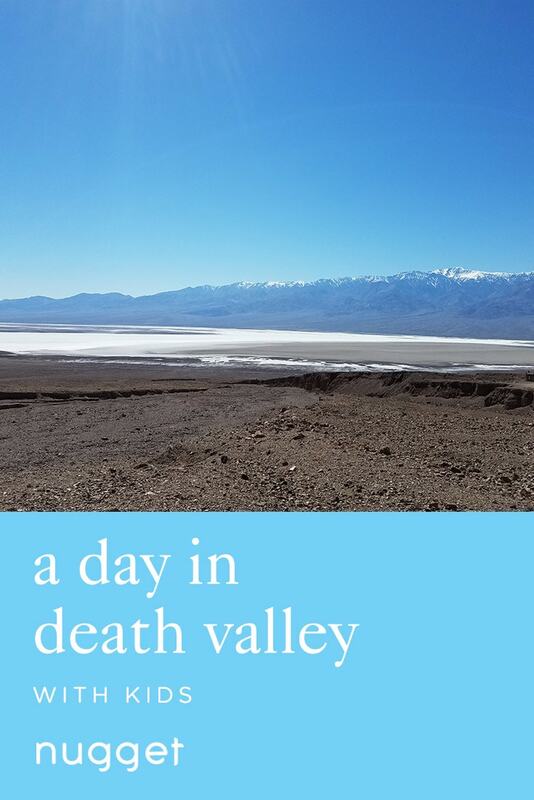 This action-packed day trip in Death Valley with kids provides an exceptional array of scenery. The first stop brings you to the salt flats at Badwater Basin, the lowest point in the North America. Next, experience a family-friendly hike at the Natural Bridge Trail. Afterwards, bring out your inner geologist at Devil’s Golf Course. Lastly, head to the Mesquite Flat Sand Dunes and frolic in the sand. Within Death Valley National Park, you and the family will see an astonishing amount of natural wonders. Catch the sunset on the way out for the perfect end to the day. The salt flats at Badwater Basin are the lowest point in North America and the views in every direction are incredible. It is an excellent spot to take some pictures as the contrast of the salt flat and blue sky is striking.If you look at the mountain side behind the parking lot, you will see a sea level marker to put the elevation in perspective. We walked out until we found a nice clean and crisp white area where you could see some undisturbed salt formations. At one point my older nugget asked "Can I lick it?" Yes, you can. TIP It is extremely bright due to the reflection off of the salt flats. Hats and sunglasses are highly recommended. The boardwalk is wheelchair and stroller friendly. Natural Bridge Trail is a fun and easy hike that allows the children to see the impact water has on our landscape. While it’s a short hike, the heat can make it a little more difficult. Take breaks along the way as necessary and hike along the shaded areas as much as possible. On your way back to the car, take in the views of the salt flats. The natural bridge is the main attraction but there are also a couple of dried up waterfalls that will catch your attention. One of our nuggets noticed that a dried water fall does not have a smooth finish but rather ridges and they stand at a slight angle. He immediately started to free climb. Devil’s Golf Course is the perfect spot for up close observations of rock salt and its formations. It can be a little intimidating at first while you figure out where to step and the best way to get around. Take it slow and know that it is not necessary to go far to get the full experience. DIRECTIONS Make a right on Badwater Road and head north for about 7 miles (11 km) then make a left onto West Side Road. TIP Terrain is very rough and requires extreme care as the rock salt is very jagged and any minor falls may result in injury. The Mesquite Flat Sand Dunes offer a complete change of scenery and seem to appear out of nowhere. Visitors can choose to do the formal hike or simply run around and play on the sand dunes. My son discovered snake tracks; which was super exciting and a bit scary. If you are there close to sunset, have some fun playing with shadows. DIRECTIONS Head back to Badwater Road and turn left. Head north for 6 miles (10 km) and then turn left onto California State Route 190 West for another 24 miles. TIP Depending on the level of play or exploration you choose to do during this stop, you may want a change of shoes.